Our only official duty is clearing Customs. It is the first time a foreign aircraft has arrived in Hawaii, so the formality is interesting. The clearance is signed by Smithy and Mr Doyle, Collector of Customs. Bedecked with leis, and overwhelmed with the good wishes of everybody who has come to welcome us, we are escorted to cars which wait to take us to Honolulu. Lady Southern Cross is in the hands of the United States Army Air Corps, among her own flesh and blood, and we leave her with confidence in the way she will be looked after. P.G. 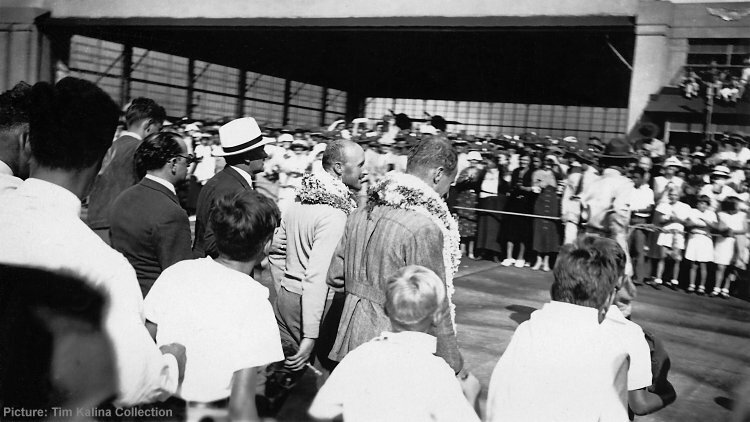 Taylor so describes their arrival at Wheeler Field, Hawaii on 29 October 1934 in his book Pacific Flight.